Inhibitory receptors (IR) are a diverse group of cell surface molecules expressed by T cells that are broadly defined by their ability to limit the immune response. These receptors do not share a common structure but are spread across the Ig, TNF, and Ly6 families of proteins and limit immune function by a variety of mechanisms (1). Numerous studies have demonstrated that IR, such as PD-L1, PD-1, LAG-3, and CTLA-4, limit T cell activation in the context of chronic infection, antitumor immunity, and other inflammatory responses (2–4). PD-L1 is a ligand for PD-1 but can also function as an IR (5, 6). During leishmaniasis, toxoplasmosis, and malaria, blockade of these molecules augments CD8+ and CD4+ T cell responses and leads to improved cytokine production, cytotoxicity, and control of parasite burden (7–9). This strategy has also been used to reinvigorate the CD8+ T cell response and promote antitumor immunity, leading to durable reductions in tumor burden in humans (10). Although there are many examples that illustrate the impact of IR on T cell activation, there remains a knowledge gap about the factors that influence the expression of these diverse surface molecules. Consistent with the phenomenon of immune exhaustion, repeated stimulation through the TCR is one mechanism that leads to increased T cell expression of IR (11–14). Previous in vitro studies have implicated Signal 3 provided by cytokines in IR expression. This is illustrated by the ability of IFN-β to enhance TIM-3 expression by murine CD4+ T cells (15) and the ability of IL-2, IL-7, IL-15, and IL-21 to promote PD-1 and PD-L1 on human CD4+ and CD8+ T cells (16). However, for TGF-β, the literature appears contradictory because during LCMV infection, PD-1 expression is increased on TGFβRII-deficient T cells (17) but decreased on T cells in TGF-β RII–dominant-negative mice (18). IL-27 is an IL-6/IL-12 family cytokine that signals through STAT1 and STAT3 and can limit the intensity and duration of the T cell response in a variety of infectious and autoimmune inflammatory conditions (19). IL-27 limits Th1, Th2, and Th17 responses and promotes production of IL-10 and differentiation of Th1-like regulatory T (Treg) cells (18–25). Consistent with its ability to promote Treg activity, IL-27 upregulates LAG-3 on Treg cells in vitro (20) and in vitro IL-27 can enhance conventional CD4+ and CD8+ T cell expression of PD-L1, LAG-3, TIM-3, Ly6C, and Sca-1 (21–27). Nevertheless, it remains unclear if IL-27 or related cytokines can promote T cell expression of multiple IR and how TCR and cytokine signals are integrated in vivo to modulate IR expression. To examine the effect of IL-27 on T cell phenotype in vivo, DNA minicircles encoding IL-27 were used to overexpress IL-27 in mice, and T cell responses were assessed by microarray and flow cytometry. This approach revealed that overexpression of IL-27 upregulated splenic T cell expression of PD-L1, LAG-3, TIGIT, and TIM-3. To determine whether this activity was direct or indirect, in vitro studies using naive CD4+ and CD8+ T cells confirmed that IL-27 alone could induce PD-L1, but its effects on LAG-3, CTLA-4, and TIGIT were dependent on TCR and the transcription factor STAT1. Although the closely related cytokine IL-6 had no such effects, IFN-γ, type I IFN, and IL-12 did upregulate a range of IR, although more modestly than IL-27. To assess the impact of endogenous IL-27 on these pathways, IR expression was examined in wild type (WT) and IL-27p28–deficient mice during acute toxoplasmosis. This infection was associated with the generation of effector T cells that expressed IR and the production of IL-27 by WT macrophage/monocyte populations at sites of infection such as the lungs. Indeed, the absence of IL-27p28 did not affect effector T cell expression of IR in the spleen, but in the lungs of IL-27–deficient mice, the levels of IR on parasite-specific effectors was diminished. Together, these findings highlight the relationship between TCR activation and cytokines that activate STAT1 to upregulate multiple IR and establish a role for endogenous IL-27 in the upregulation of multiple IR in vivo during infection with Toxoplasma gondii. Six-week-old female C57BL/6 controls were purchased from Taconic. Mice deficient in IL-27p28 (C57BL/6 background) were originally provided by Janssen Research & Development (Spring House, PA). STAT1−/− mice (129S6/SvEv-Stat1tm1Rds) and 129S6 control mice were purchased from Taconic. IL-27p28–GFP reporter mice were generated as previously described (28). Mice were housed and bred in specific pathogen-free facilities in the Department of Pathobiology at the University of Pennsylvania in accordance with institutional guidelines. The Me49 Strain of T. gondii was prepared from chronically infected CBA/ca mice, and experimental animals were infected i.p. with 20 cysts. Six-week-old female BALB/c mice were injected with 20 μg of either empty vector or linked human IL-27 minicircle DNA (System Biosciences, Palo Alto, CA) in 2 ml of 0.9% normal saline via the tail vein over the course of 5 s. Injected animals were transferred to an empty cage with a heating pad to recover for 5 min. Whole blood was collected into K2-EDTA tubes for plasma separation 24 h after minicircle injection, and plasma IL-27 levels were confirmed by ELISA. Whole blood and spleens were collected from mice 5 d after minicircle injection. Splenocytes from C57BL/6 mice were obtained by mechanically dissociating the spleen, filtering it through a 40-μm nylon strainer, and lysing RBCs with ACK lysis buffer. T cells were enriched using a Mouse CD3+ T Cell Enrichment Column (MTCC-25; R&D Systems). Cells were then stained with Live/Dead Fixable Aqua Dead Cell Stain (L34957; Thermo Fisher), anti-CD4 (GK1.5, 100447; BioLegend), anti-CD8 (53-6.7, 562283; BD Biosciences), anti-CD44 (IM7, 0441-82; eBioscience), anti-CD62L (MEL-14, 47-0621-82; eBioscience), anti-Ly6C (HK1.4, 45-5932-82; eBioscience), and anti–Sca-1 (D7, 56-5981-82; eBioscience) Abs and were sorted on a FACSAria II flow cytometer (BD Biosciences). Cells were plated in tissue culture-treated round-bottom 96-well plates, 1–2 × 105 per well in 200 μl of RPMI 1640 supplemented with 10% FBS, 100 U/ml penicillin, 100 U/ml streptomycin, 1 mM sodium pyruvate, 1× MEM nonessential amino acids (Life Technologies), 55 μM 2-ME. The tissue culture plates were precoated with 1 μg/ml anti-CD3 (145-2C11; BioXCell) for 3 h at 37°, and excess anti-CD3 was rinsed off with PBS. Cells were stimulated in the presence of anti-CD28 (37.N.51.1, 1 μg/ml), IL-2 (Proleukin, 100 U/ml), anti–IFN-γ (XMG1.2; BioXCell, 1 μg/ml) (except when exogenous IFN-γ was tested), and anti–IL-4 (11B11; BioXCell, 1 μg/ml). Recombinant IL-27 (Amgen) was used at a concentration of 50 ng/ml, TGF-β (eBioscience) was used at 5 ng/ml, and Universal Type I IFN (PBL Assay Science) was used at a concentration of 2000 U/ml. IFN-γ (R&D Systems), IL-6 (eBioscience), IL-12 (eBioscience), TNF-α (eBioscience), IL-10 (eBioscience), and IL-7 (Peprotech) were used at 10 ng/ml. IL-15 (Peprotech) and IL-15Ra-Fc (R&D Systems) were incubated at 37° for 30 min at a ratio of 2:9. The resulting IL-15 complexes were used at 55 ng/ml (10 ng/ml IL-15 plus 45 ng/ml IL-15Ra). Ten days postinfection with T. gondii, lungs were harvested, and a 0.5-cm diameter lung punch biopsy specimen was extracted. This was cultured in a tissue culture-treated round-bottom 96-well plate in 200 μl of RPMI 1640 supplemented with 10% FBS, 100 U/ml penicillin, 100 U/ml streptomycin, 1 mM sodium pyruvate, 1× MEM nonessential amino acids (Life Technologies), and 55 μM 2-ME. These were cultured for 24 h before the supernatant was harvested and frozen for analysis by ELISA. Mouse splenocytes were prepared by mechanical dissociation of whole spleens, followed by ACK lysis of RBCs. Total RNA was extracted from splenocytes with the RNeasy Mini Kit (Qiagen 74104) and adjusted to 20 ng/μl in nuclease free water (Qiagen 19101). Gene expression profiling on was performed on Affymetrix GeneChip Mouse Gene 2.0 ST Arrays (Applied Biosystems 902118). Processing of RNA samples, hybridization, and array scanning were carried out using standard Affymetrix GeneChip protocols at the Boston University Microarray and Sequencing Resource. All CEL files were normalized by Robust Multiarray Average (29), and gene expression data were preprocessed by removing unexpressed probes and discarding transcripts with high interreplicate coefficient of variance. Subsequent analyses (mean expression, fold change, t test) were performed in R. Datasets are available at National Center for Biotechnology Information Gene Expression Omnibus under accession number GSE124222 (https://www.ncbi.nlm.nih.gov/geo/query/acc.cgi?acc=GSE124222). Cells were stained with the reagents used for cell sorting, described above, as well as Abs specific for CTLA-4 (UC10-4B9; BioLegend 106306), PD-L1 (10F.9G2; BioLegend 124319 or 124314), LAG-3 (C9B7W; BioLegend 125210 or eBioscience 48-2231-82), PD-1 (29F.1A12; BioLegend 135220 or J43; eBioscience 25-9985-82), TIGIT (GIGD7; eBioscience 50-9501-82), and TIM-3 (RMT3-23; BioLegend 119704 or 199721). CTLA-4 staining was performed after fixation and permeabilization of the cells. For analyses postinfection, splenocytes were harvested as detailed above, and peritoneal exudate cells were harvested by i.p. lavage with 7 ml of PBS. MHC class I (MHC-I) monomers loaded with peptide (SVLAFRRL) from the T. gondii protein Tgd-057 were kindly provided by E. J. Wherry (University of Pennsylvania) and tetramerized by incubation with streptavidin-conjugated PE or allophycocyanin. Some experiments used PE- and allophycocyanin-conjugated MHC-I tetramers loaded with the Tgd-057 peptide that were provided by the National Institutes of Health Tetramer Facility. PE- or allophycocyanin-conjugated MHC class II (MHC-II) tetramers loaded with the AS15 peptide AVEIHRPVPGTAPPS were also provided by the National Institutes of Health Tetramer Facility. Flow cytometry data acquisition was performed on an LSRFortessa or LSRFortessa X-20 (BD Biosciences) and analysis was performed with FlowJo (Tree Star). Cells were gated on lymphocytes (by forward scatter [FSC] and side scatter [SSC]), singlets (by FSC-width versus FSC-height and SSC-width versus SSC-height), and live cells (by exclusion of Aqua Dead Cell Stain). CD4+ T cells were gated CD4+CD8−Foxp3−, CD8+ T cells were gated CD8+CD4−, and Treg cells were gated CD4+CD8−Foxp3+. Statistical significance was determined using GraphPad Prism software using a paired or unpaired Student t test, as indicated. The p values <0.05 were considered significant. To assess the global effects of IL-27 on T cell phenotype in vivo, DNA plasmid minicircles that encode IL-27 were administered to mice by hydrodynamic transfection (30), which results in high systemic levels of IL-27 (31). Total splenocytes were harvested from these mice 5 d later and analyzed by Affymetrix GeneChip Mouse Gene 2.0 ST Array. Over 400 genes were changed by ≥ 1.0 log2 fold in response to administration of IL-27 (Fig. 1A). Among these were multiple transcripts for genes that play key inhibitory roles in the immune response. Ly6a (encodes Sca-1), Lag3, Tigit, and Il10 were upregulated by splenocytes in response to IL-27 (Fig. 1B). There was also a trend toward IL-27–mediated upregulation of Ctla4 and Cd274 (encodes PD-L1) that was <1 log2 fold induction (data not shown). To validate the modulation of the transcription of these genes, flow cytometry was used to assess the expression of PD-L1, LAG-3, TIGIT, and TIM-3 on T cells from these mice. Administration of IL-27 minicircles led to upregulation of PD-L1, LAG-3, and TIGIT in splenic and peripheral blood CD4+ T cells (Fig. 1C). In CD8+ T cells, IL-27 minicircles upregulated PD-L1, LAG-3, TIGIT, and TIM-3. Thus, overexpression of IL-27 in vivo leads to upregulation of multiple IR by splenic T cells. The gene expression analysis described above does not distinguish whether the overexpression of IL-27 had direct or indirect effects on T cell expression of IR. Therefore, to directly determine the effects of IL-27 on T cells, naive (CD44loCD62L+Ly6C−Sca1−) CD4+ or CD8+ T cells were sort purified, stained with CFSE, and cultured with or without anti-CD3 and anti-CD28 Ab stimulation (TCR stimulation) in the presence or absence of IL-27. Ly6C−Sca-1− cells were used because of previous findings that Ly6C and Sca-1 expression result from exposure to TCR stimulation and cytokines including IL-27 (23, 25, 27, 32, 33). IL-27 alone upregulated PD-L1 on CD4+ T cells, whereas IL-27 combined with TCR stimulation synergized to upregulate expression of LAG-3, TIGIT, and TIM-3 but did not upregulate expression of CTLA-4 or PD-1 (Fig. 2 and data not shown). TCR stimulation resulted in robust proliferation as measured by CFSE dilution, and upregulation of PD-L1, LAG-3, and CTLA-4 was observed on undivided cells. Expression of CTLA-4, TIGIT, and TIM-3 was highest on the populations that had divided the most, whereas expression of PD-L1 decreased as cells divided (Fig. 2). Similar results were seen with Foxp3+ regulatory T cells (Supplemental Fig. 1). For naive CD8+ T cells, IL-27 induced expression of PD-L1 in the absence of anti-CD3/CD28 simulation and further enhanced anti-CD3/CD28–induced expression of LAG-3, CTLA-4, TIGIT, and TIM-3 but not PD-1 (Fig. 3 and data not shown). Similar to what was seen for CD4+ T cells, expression of CTLA-4, TIGIT, and TIM-3 increased with cell proliferation, whereas PD-L1 decreased as cells divided (Fig. 3). In these flow-based assays, the induction of high levels of PD-L1, LAG-3, and CTLA-4 was reproducibly observed on more than 50% of the cells, whereas maximal induction of TIGIT and TIM-3 was apparent on <20% of these populations. 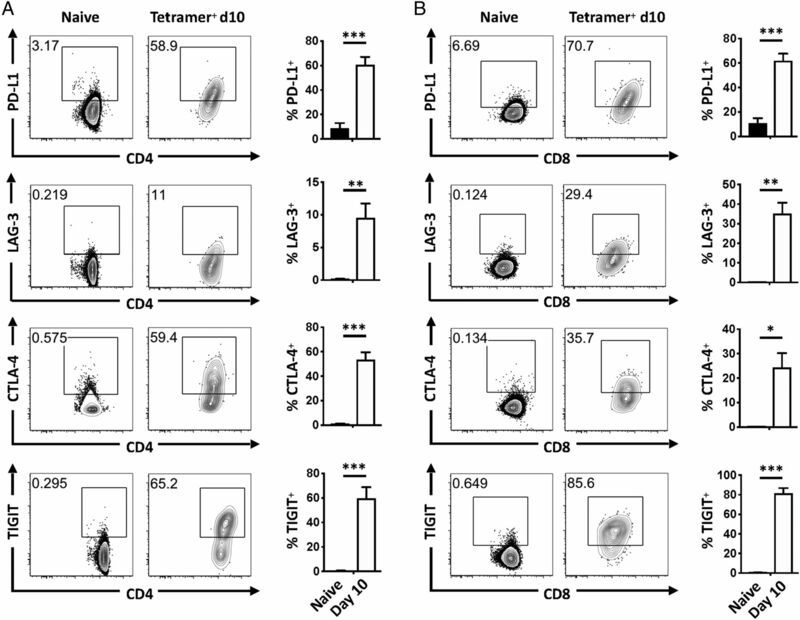 Nevertheless, these results show that IL-27 enhances T cell expression of multiple IR and that these effects are strongest in conventional (Foxp3−) CD4+ and CD8+ T cells. It is important to note that high levels of IR expression were associated with T cell proliferation and that this was also enhanced in the presence of IL-27, indicating that IL-27 is not leading to functional exhaustion. Because variations in the strength of TCR signal influence T cell activation, studies were performed in which naive CD8+ T cells were cultured in the presence of soluble anti-CD28 with increasing concentrations of plate-bound anti-CD3 and expression of PD-L1, LAG-3, and CTLA-4 assessed. Stimulation with 0.1 μg/ml anti-CD3 was suboptimal and did not increase T cell proliferation or IR expression (Fig. 4A–C). At 1 μg/ml, anti-CD3 upregulated expression of each IR, as shown in Fig. 1. Increasing anti-CD3 to 10 μg/ml did not enhance expression of PD-L1 (Fig. 4A, open circles) but further upregulated expression of LAG-3 and CTLA-4 (Fig. 4B, 4C), illustrating that the expression of LAG-3 and CTLA-4 vary with strength of TCR signal. In the presence of IL-27, several distinct patterns of expression were observed. As noted previously, IL-27 alone induced PD-L1 in T cells, but PD-L1 expression decreased with anti-CD3 stimulation. Because PD-L1 expression is lowest in cells that have most diluted CFSE, this effect was likely due to dilution of PD-L1 as cells proliferated (Fig. 4A). In contrast, IL-27 upregulated expression of LAG-3 at both 1 and 10 μg/ml of anti-CD3 stimulation. For CTLA-4, IL-27 upregulated CTLA-4 at 1 μg/ml anti-CD3, but at 10 μg/ml anti-CD3, CTLA-4 expression was maximal and no effect of IL-27 was noted. Together, these data sets affirm the central role of TCR stimulation on IR expression and find that the effects of IL-27 are more apparent at intermediate levels of anti-CD3. IL-27 can signal through multiple STAT pathways, and its ability to activate STAT1 is required for the induction of IL-10 (34) as well as PD-L1, LAG-3, CTLA-4, TIGIT, and TIM-3 (Supplemental Fig. 2). Because related type I cytokines also activate STAT1, a survey was performed to examine the ability of IFN-γ, type I IFN, IL-6, and IL-12 to modulate IR expression. In the absence of anti-CD3/CD28 stimulation, IFN-γ, type I IFN, and IL-12 (but not IL-6) upregulated CD8+ and CD4+ T cell expression of PD-L1 (Fig. 5A). In the presence of anti-CD3/CD28 stimulation, IL-12 stimulated CD4+ and CD8+ T cell expression of LAG-3 (Fig. 5B) and TIM-3 (Fig. 5C), and type I IFN upregulated TIM-3 in CD8+ T cells (Fig. 5C). Thus, although IL-12 and IFNs (but not the more closely related IL-6) did share some stimulatory effects on IR, none of those tested upregulated as many IR as IL-27. The role of TGF-β in the modulation of IR expression in the presence and absence of IL-27 was also examined. In cells stimulated with anti-CD3/CD28, TGF-β limited expression of PD-L1 (Fig. 5D). Similarly, in cells stimulated with anti-CD3/CD28 in the presence of IL-27, TGF-β limited expression of LAG-3, CTLA-4, TIGIT, and TIM-3, but not PD-L1. As PD-L1 is the only IR in this panel induced by IL-27 in the absence of anti-CD3/CD28 stimulation, these findings suggest that TGF-β has a dominant role in the inhibition of TCR-mediated IR expression. 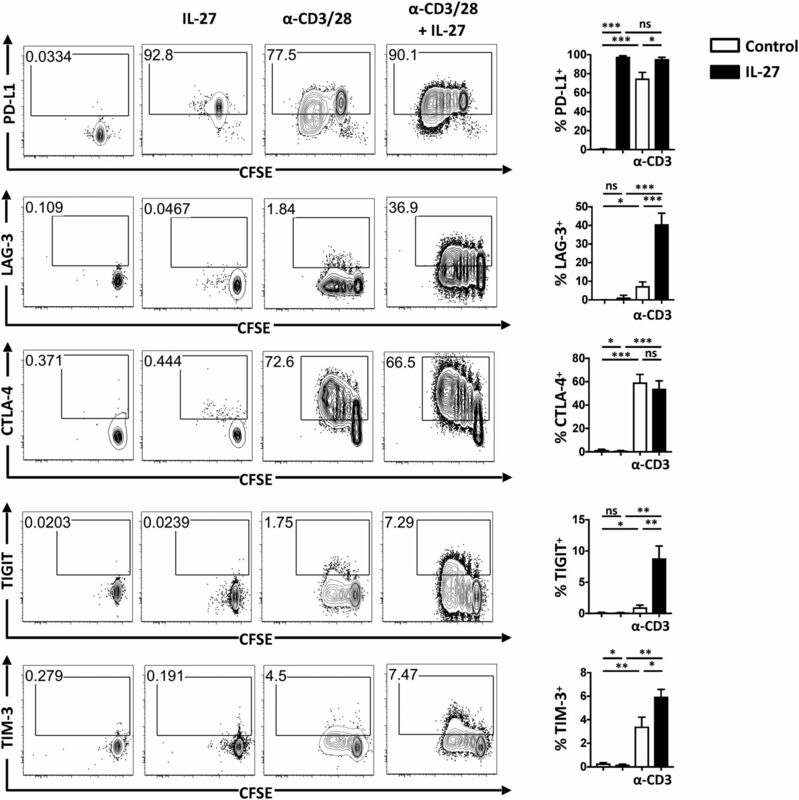 Because IL-27 limits the CD4+ and CD8+ T cell response during acute toxoplasmosis, mice were infected with T. gondii, and IR expression was examined on parasite-specific T cells from the spleens and lungs 10–12 d postinfection. T. gondii–specific T cells were identified using parasite-specific MHC-I or MHC-II tetramers in combination with high expression of LFA-1 (35). 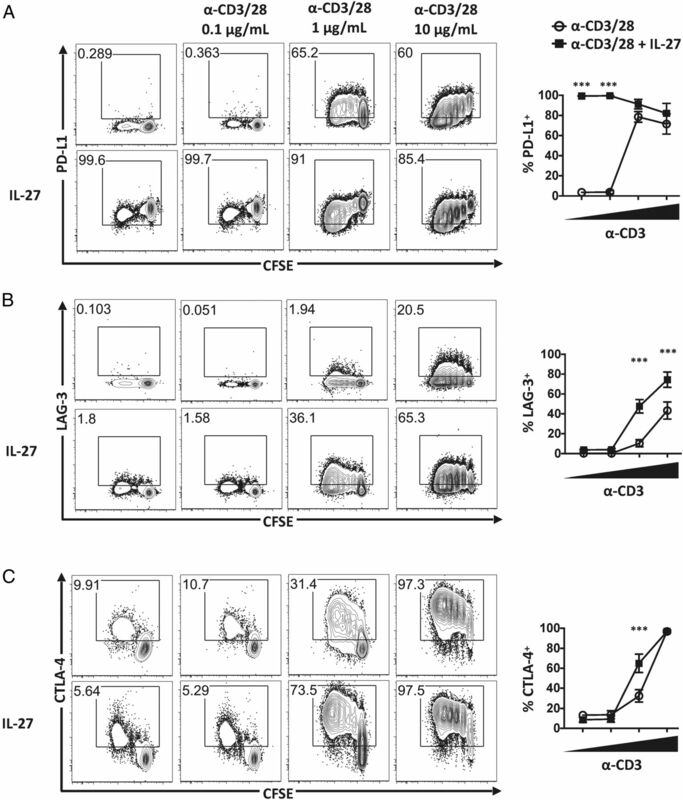 In uninfected mice, LFA-1lo splenic Foxp3− CD4+ T cells (Fig. 6A) and CD8+ T cells (Fig. 6B) expressed low levels of each IR examined. At day 10 postinfection, tetramer+ CD4+ and CD8+ T cells expressed high levels of PD-L1, LAG-3, CTLA-4, and TIGIT (Fig. 6A, 6B). Thus, T cell activation and expansion during acute toxoplasmosis is associated with a marked increase in IR expression. At day 10–12 postinfection, parasite burden is low in the spleen but high in the lungs (data not shown), and previous studies have found that T. gondii infection induces production of IL-27 (31, 34, 36). The use of an IL-27p28 reporter revealed that in infected mice, the frequency of IL-27p28 producers in the lung (18%) was twice that seen in the spleen (9%) (Fig. 7A). In both the lung and the spleen, IL-27p28 was primarily expressed by macrophage and monocyte populations (Fig. 7B). In addition, low levels of soluble IL-27p28 was detected in lung punches from uninfected mice, but higher levels were detected in samples from infected lungs (uninfected = 34 ± 5.5 pg/ml, infected = 178 ± 25 pg/ml, mean ± SEM; p = 0.003). To determine if endogenous IL-27 contributes to T cell expression of IR, WT and Il27p28−/− mice were infected with T. gondii as above, and IR expression was assessed on T cells from the spleen and lung at day 11–12 of infection. In the spleen, there was lower expression of CTLA-4 by Il27p28−/− CD4+ T cells, but levels of the other molecules were comparable in WT and Il27p28−/− mice (Supplemental Fig. 3). In the lung, PD-1 and TIM-3 were also comparable in WT and Il27p28−/− mice (data not shown), but compared with WT cells, expression of PD-L1, CTLA-4, and TIGIT was decreased on tetramer+ CD4+ T cells from Il27p28−/− mice (Fig. 7C). Among parasite-specific CD8+ T cells in the lung, expression of CTLA-4 was not statistically lower on Il27p28−/− CD8+ T cells, whereas the levels of PD-L1, LAG-3, and TIGIT were reduced (Fig. 7D). These results indicate that during toxoplasmosis, the local production of IL-27 at sites of ongoing inflammation contributes to expression of PD-L1, LAG-3, CTLA-4, and TIGIT. Although initial reports highlighted the ability of IL-27 to enhance the production of IFN-γ (37, 38), it is now appreciated that this cytokine engages a wide array of mechanisms to limit adaptive T cell responses. IL-27 can promote T cell production of IL-10 as well as directly antagonize Th1, Th2, and Th17 activities (39, 40). Previous studies have also linked IL-27 to IR expression and found that IL-27 upregulated T cell expression of PD-L1, which in turn limited Th17 responses (22). The present study confirmed that IL-27 directly promoted T cell expression of PD-L1 but also found that in vitro, IL-27 synergized with TCR signals to increase levels of LAG-3, CTLA-4, TIGIT, and TIM-3. Furthermore, during acute toxoplasmosis, parasite-specific effectors upregulated PD-L1, LAG-3, CTLA-4, and TIGIT, and at a local site of infection where there was parasite Ag and high levels of IL-27, this cytokine was required for maximal IR expression. In that context, the finding that ectopic expression of IL-27 in uninfected mice was sufficient to enhance T cell IR expression in the spleen was unexpected. Although these data support the idea that local levels of IL-27 can directly influence IR expression, they also emphasize the need for additional studies to examine the factors that control IR expression on different subsets of Ag-experienced cells. The observation that levels of TCR stimulation had a graded effect on IR expression highlights questions about how TCR- and cytokine-mediated signals might be integrated to determine the threshold required to induce multiple IR. Increasing levels of TCR stimulation results in increased chromatin accessibility (41) and posthoc analysis of chromatin immunoprecipitation sequencing data from T cells stimulated with IL-6 or IL-27 (22) indicated that IL-27–induced STAT1 binds to regions directly upstream of the genes for PD-L1, LAG-3, CTLA-4, TIGIT, and TIM-3 (analysis not shown). However, other cytokines that activate STAT1 induce only a subset of IR (most notably PD-L1), whereas IL-6, which also activates STAT1 and shares the gp130 receptor with IL-27, does not display these properties. These observations indicate that in addition to STAT1, other signals through the IL-27Rα-chain are integrated with TCR activation to upregulate a subset of IR. One issue raised by the studies presented in this paper is how the ability of pathogen-specific T cells to integrate multiple signals to modulate IR expression affects the outcome of infection. It is well appreciated that the avidity and duration of the T cell–dendritic cell (DC) synapse, as well as the number of times a T cell encounters a DC presenting cognate peptide, are influenced by the levels of inflammation and Ag availability (42). The ability to coordinate IR expression with overall levels of inflammation could provide one mechanism to allow the development of T cell responses but also limit collateral damage. For example, early in infection, when the amount of microbial Ag is typically low, this would allow T cells to respond to low levels of TCR stimulation with minimal inhibition. As infection proceeds and parasite-specific effector T cells upregulate IL-27Rα (43), they would be responsive to the IL-27 produced locally at sites that contain high levels of parasite-derived Ag, and this would promote IR expression. There are many likely downstream consequences of these events that include direct, cell-intrinsic activities of IR on T cell function (6, 44–47). In addition, because T cells expressing LAG-3 and CTLA-4 limit the ability of DCs to prime T cells (48–52) and IL-27 promotes T cell expression of IL-10 (34, 53, 54), which also limits DC activity (55), it appears that IL-27 endows T cells with multiple mechanisms to temper DC activities and thereby prevent immune hyperactivity. In murine models of toxoplasmosis, leishmaniasis, and malaria, the absence of IL-27 results in severe T cell–mediated pathological immune responses (56–59). In these settings, it is unclear whether the ability of IL-27 to induce IR contributes to this suppression, but these regulatory pathways are operational, as IR blockade increases T cell function and promotes parasite control (8, 9, 60). Moreover, CTLA-4–Ig can act as an agonist that inhibits DC function, and it is notable that this fusion protein limits the T. gondii–induced pathological CD4+ T cell response in IL-27Rα–deficient mice (61). This observation is consistent with the idea that the reduced levels of CTLA-4 observed in the absence of IL-27 may underlie the development of pathological responses seen in these mice. Indeed, IL-27Rα–deficient mice infected with Plasmodium berghei develop pathological immune responses (58), and with this infection in WT mice, blockade of CTLA-4 and PD-L1 results in immune hyperactivity (59). In mice infected with Leishmania donovani, a similar phenomenon is seen in which IL-27 limits immune hyperactivity and CTLA-4 blockade strengthens the immune response (7, 60). Together, these studies link IL-27 expression to systems in which IR are functional, but these correlations are not restricted to infectious systems. For example, during collagen-induced arthritis, IL-27–Fc administration alleviates disease and promotes Treg cell expression of PD-1 and CTLA-4 (62). Similarly, mice deficient for IL-27Rα or the EBI-3 subunit of IL-27 have an increased ability to control B16F10 melanoma associated with enhanced CD8+ T cell responses (24, 63), and in this model, a landmark study concluded that IL-27 is required for maximal T cell expression of LAG-3, TIGIT, and TIM-3 (64). Consequently, the ability of IL-27 to promote IR expression in the context of infection, autoimmune inflammation, and cancer should be considered one of the regulatory properties of this cytokine that allows it to temper T cell–mediated inflammatory processes. C.A.H. is a member of the Scientific Advisory Board and Scientific Founder of Surface Oncology. The other authors have no financial conflicts of interest. We thank the University of Pennsylvania Flow Cytometry & Cell Sorting Facility. We acknowledge the National Institutes of Health Tetramer Core Facility (contract HHSN272201300006C) for provision of the MHC-I and MHC-II tetramer.
. 1998. Blockade of CTLA-4 enhances host resistance to the intracellular pathogen, Leishmania donovani. J. Immunol. 161: 4153–4160.
. 2011. Control of Toxoplasma reactivation by rescue of dysfunctional CD8+ T-cell response via PD-1-PDL-1 blockade. Proc. Natl. Acad. Sci. USA 108: 9196–9201.
. 2018. Fundamental mechanisms of immune checkpoint blockade therapy. Cancer Discov. 8: 1069–1086.
. 2015. Interferon-β suppresses murine Th1 cell function in the absence of antigen-presenting cells. PLoS One 10: e0124802.
. 2008. The common gamma-chain cytokines IL-2, IL-7, IL-15, and IL-21 induce the expression of programmed death-1 and its ligands. J. Immunol. 181: 6738–6746.
. 2016. TGF-β receptor maintains CD4 T helper cell identity during chronic viral infections. J. Clin. Invest. 126: 3799–3813.
. 2015. The immunobiology of interleukin-27. Annu. Rev. Immunol. 33: 417–443.
. 2016. An IL-27/Lag3 axis enhances Foxp3+ regulatory T cell-suppressive function and therapeutic efficacy. Mucosal Immunol. 9: 137–145.
. 2012. 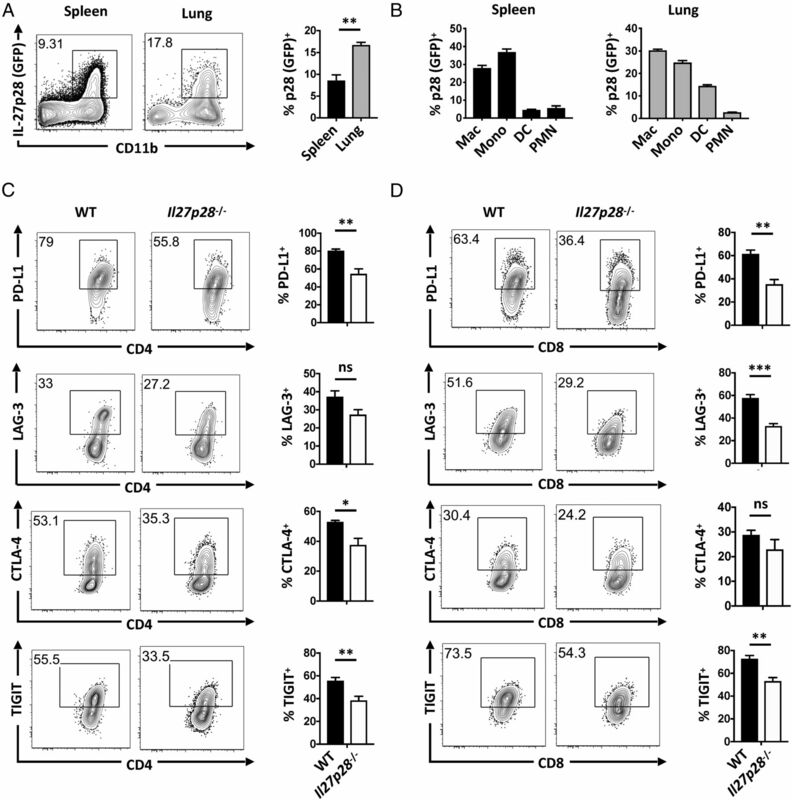 The cytokines interleukin 27 and interferon-γ promote distinct Treg cell populations required to limit infection-induced pathology. Immunity 37: 511–523.
. 2012. Interleukin-27 priming of T cells controls IL-17 production in trans via induction of the ligand PD-L1. Immunity 36: 1017–1030.
. 2013. IL-27 enhances the survival of tumor antigen-specific CD8+ T cells and programs them into IL-10-producing, memory precursor-like effector cells. Eur. J. Immunol. 43: 468–479.
. 2015. 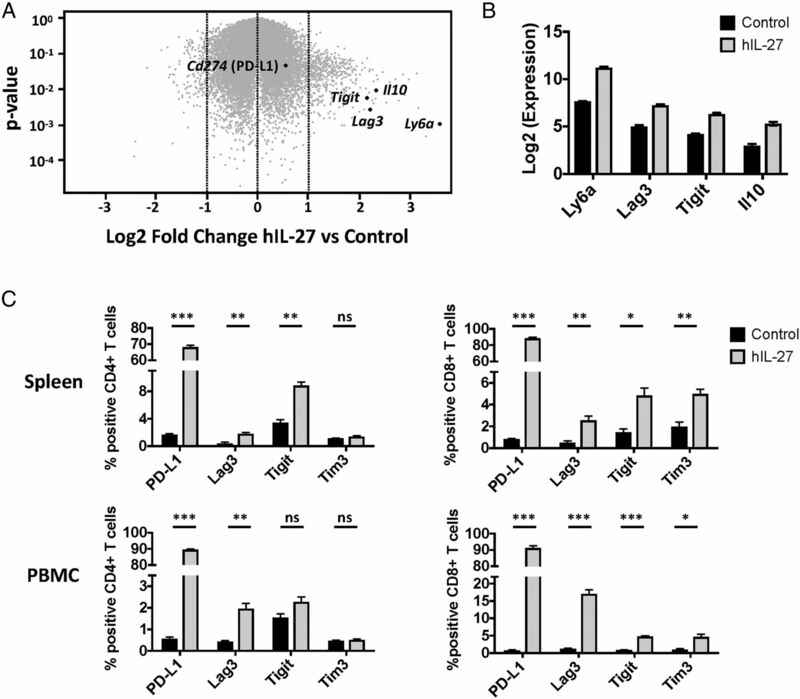 An IL-27/NFIL3 signalling axis drives Tim-3 and IL-10 expression and T-cell dysfunction. [Published erratum appears in 2015 Nat. Commun. 6: 7657.] Nat. Commun. 6: 6072.
. 2016. Systemic delivery of IL-27 by an adeno-associated viral vector inhibits T cell-mediated colitis and induces multiple inhibitory pathways in T cells. J. Leukoc. Biol. 100: 403–411.
. 2017. Function and regulation of LAG3 on CD4+CD25- T cells in non-small cell lung cancer. Exp. Cell Res. 360: 358–364.
. 2018. Cytokine- and TCR-mediated regulation of T cell expression of Ly6C and Sca-1. J. Immunol. 200: 1761–1770.
. 2018. IL-27p28 production by XCR1+ dendritic cells and monocytes effectively predicts adjuvant-elicited CD8+ T cell responses. Immunohorizons 2: 1–11.
. 2005. Improved production and purification of minicircle DNA vector free of plasmid bacterial sequences and capable of persistent transgene expression in vivo. Hum. Gene Ther. 16: 126–131.
. 2010. A role for IL-27p28 as an antagonist of gp130-mediated signaling. Nat. Immunol. 11: 1119–1126.
. 1986. Phenotypic changes induced by interferon in resting T cells: major enhancement of Ly-6 antigen expression. J. Immunol. 137: 201–210.
. 2001. Type I interferon is the primary regulator of inducible Ly-6C expression on T cells. J. Interferon Cytokine Res. 21: 621–629.
. 2014. Parasite fate and involvement of infected cells in the induction of CD4+ and CD8+ T cell responses to Toxoplasma gondii. PLoS Pathog. 10: e1004047.
. 2013. CD4+ T cells are trigger and target of the glucocorticoid response that prevents lethal immunopathology in toxoplasma infection. J. Exp. Med. 210: 1919–1927.
. 2002. IL-27, a heterodimeric cytokine composed of EBI3 and p28 protein, induces proliferation of naive CD4+ T cells. Immunity 16: 779–790.
. 2003. Cutting edge: role of IL-27/WSX-1 signaling for induction of T-bet through activation of STAT1 during initial Th1 commitment. J. Immunol. 170: 4886–4890.
. 2012. The immunobiology of IL-27. Adv. Immunol. 115: 1–44.
. 2012. Interleukin-27: balancing protective and pathological immunity. Immunity 37: 960–969.
. 2017. Priming of transcriptional memory responses via the chromatin accessibility landscape in T cells. Sci. Rep. 7: 44825. 2016. Cell signaling pathways that regulate antigen presentation. J. Immunol. 197: 2971–2979.
. 2005. Positive and negative regulation of the IL-27 receptor during lymphoid cell activation. J. Immunol. 174: 7684–7691.
. 2017. T cell costimulatory receptor CD28 is a primary target for PD-1-mediated inhibition. Science 355: 1428–1433.
. 2004. Role of LAG-3 in regulatory T cells. Immunity 21: 503–513.
. 2007. Human dendritic cells acquire a semimature phenotype and lymph node homing potential through interaction with CD4+CD25+ regulatory T cells. J. Immunol. 178: 4184–4193.
. 2008. 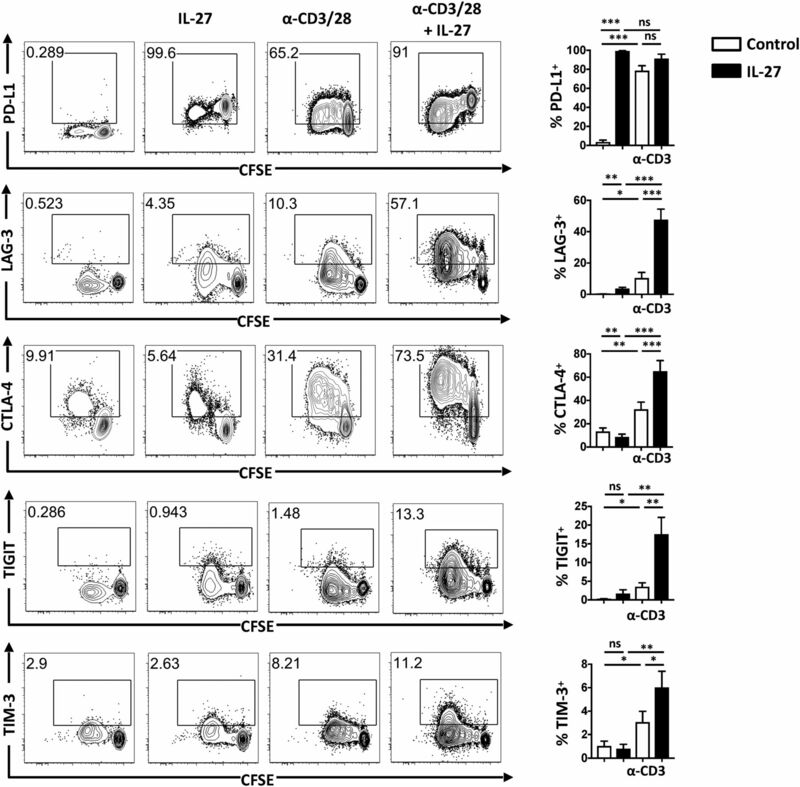 Regulatory T cells inhibit dendritic cells by lymphocyte activation gene-3 engagement of MHC class II. J. Immunol. 180: 5916–5926.
. 2008. CTLA-4 control over Foxp3+ regulatory T cell function. Science 322: 271–275.
. 2011. Trans-endocytosis of CD80 and CD86: a molecular basis for the cell-extrinsic function of CTLA-4. Science 332: 600–603.
. 2007. A dominant function for interleukin 27 in generating interleukin 10-producing anti-inflammatory T cells. Nat. Immunol. 8: 1380–1389.
. 2010. Essential role for IL-27 receptor signaling in prevention of Th1-mediated immunopathology during malaria infection. J. Immunol. 185: 2482–2492.
. 2012. The CTLA-4 and PD-1/PD-L1 inhibitory pathways independently regulate host resistance to Plasmodium-induced acute immune pathology. PLoS Pathog. 8: e1002504.
. 2009. B7-H1 blockade increases survival of dysfunctional CD8(+) T cells and confers protection against Leishmania donovani infections. PLoS Pathog. 5: e1000431.
. 2006. Interleukin 27 negatively regulates the development of interleukin 17-producing T helper cells during chronic inflammation of the central nervous system. Nat. Immunol. 7: 937–945.
. 2013. In vivo action of IL-27: reciprocal regulation of Th17 and Treg cells in collagen-induced arthritis. Exp. Mol. Med. 45: e46.
. 2008. 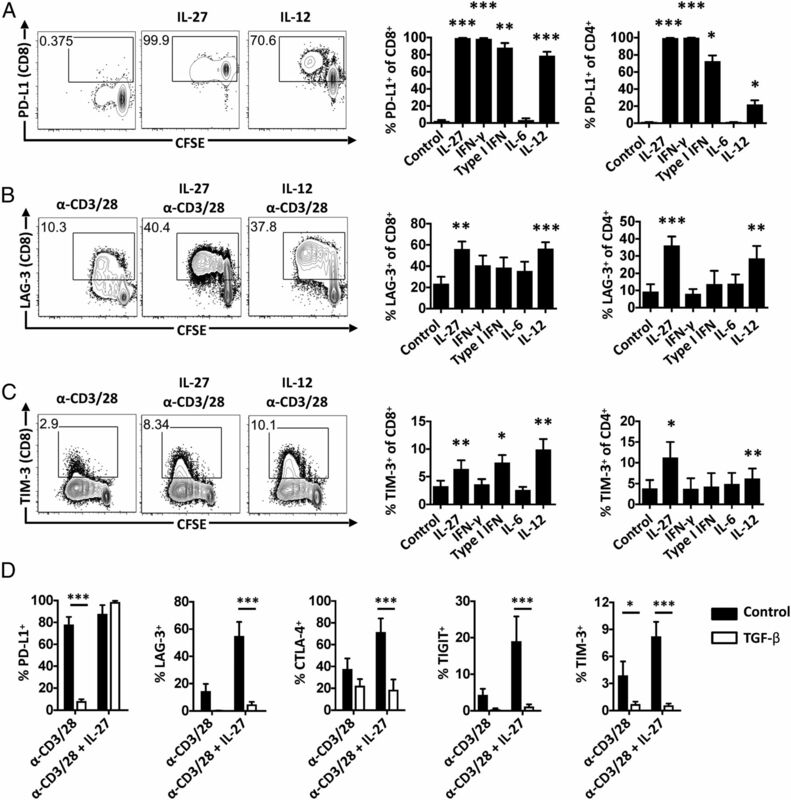 Immunosurveillance of lung melanoma metastasis in EBI-3-deficient mice mediated by CD8+ T cells. J. Immunol. 181: 6148–6157.
. 2018. Induction and transcriptional regulation of the co-inhibitory gene module in T cells. Nature 558: 454–459.